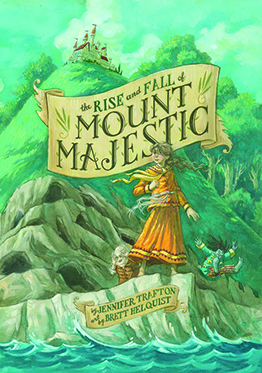 A girl who wants to be a hero but is saddled with the last name "Smudge"
A castle built on top of a mountain that rises and falls once each day. Books with good girl heroes are hard to find. When the hero is a girl, most often she is decidedly boyish (or at the very least tomboyish): armor-wearing, sword-swinging, that sort of thing. But Persimmony Smudge is a different sort. She dreams of battles, yes, but when it comes down to it, it’s her brain and her bravery, and not her battle skills, that save the day. I suspect the author is Christian, simply because I know that many of her author friends are Christian. There is, however, no mention made of God, with the only “supernatural” elements being a Lyre-That-Never-Lies, which sings out a prophetic poem now and then, and clay pots that give the recipient whatever it is they need (and not merely what they might want). 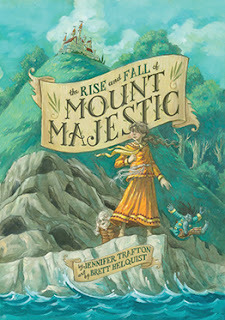 When the topic comes up about who it is that puts the gifts in the pots, and puts “words of truth into the strings of a Lyre” the only answer we get is, “I have no idea.” So Mount Majestic is simply a fun read, one without any spiritual depth – that dimension is left entirely unexplored. I’ve heard that some girls as young as Grade 2 have enjoyed this, but at 300+ pages, I would think this either a book for mom and dad to read to the kids (maybe then as early as Grade 1) or maybe something better suited to Grade 3 and up. Boys should like it too, though I do know, as a boy, I had a bias against “girl books” (I never read a Nancy Drew, but devoured everything in the Hardy Boys’ series). You can order it at Amazon.com here or at Amazon.ca here.